In an effort to keep our members informed on the Zebra Mussel issue in the Iowa Great Lakes, we share this article published recently in the New York Times. 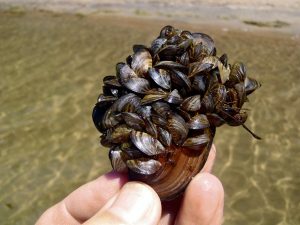 Since they arrived in the Great Lakes in the 1980s, two species of mussels the size of pistachios have spread to hundreds of lakes and rivers in 34 states and have done vast economic and ecological damage. These silent invaders, the quagga and zebra mussels, have disrupted ecosystems by devouring phytoplankton, the foundation of the aquatic food web, and have clogged the water intakes and pipes of cities and towns, power plants, factories and even irrigated golf courses. Inspired by Rachel Carson’s “Silent Spring” in high school, Dr. Molloy, now 66, has long been a pioneer in the development of environmentally safe control agents to replace broad-spectrum chemical pesticides. Zequanox killed more than 90 percent of the mussels in a test using tanks of water from Lake Carlos in Minnesota, said James A. Luoma, a research biologist with the United States Geological Survey in La Crosse, Wis. A control group of freshwater mussels, unionids from the Black River in Wisconsin, were unharmed. In 2011, the federal Environmental Protection Agency reported that P. fluorescens CL145A presented “little risk to nontarget organisms.” The agency is now evaluating proposed open-water uses for Zequanox. Natives of Eastern Europe in the genus Dreissena, zebra and quagga mussels began moving up the Volga River toward Western Europe 200 years ago. Highly prolific, they attach themselves to boats or any hard surface with their byssus, or beard. They can live out of water for two weeks, and their larvae, known as veligers, use currents to colonize new waters. As many as 700,000 mussels can pile up in a square yard. Both species are thought to have arrived in North America in the ballast of trans-Atlantic cargo ships. By 1991 they appeared in the Hudson River, and within a year there were 500 billion between Troy and West Point, saidDavid L. Strayer, an ecologist with the Cary Institute of Ecosystem Studies in Millbrook, N.Y. The tiny mussels became a dominant species in the Hudson. Not even counting their shells, their total weight exceeded that of all the fish, plankton and bacteria combined, Dr. Strayer said, adding that they filtered “a volume of water equal to that of all the water in the estuary every one to four days.” There were no natural enemies to keep them in check. None, that is, except scientists like Dr. Molloy. His fascination with water goes back to childhood summers on Lake Hopatcong, in New Jersey, where his father, an Irish-born lieutenant in the New York Fire Department, had built a cottage. In 1956, when Dan was 8, his father and five other firefighters were killedwhen a wall collapsed in a storefront blaze — still the department’s worst disaster in the Bronx. Their children were given scholarships to Fordham University; the young Mr. Molloy got his bachelor’s and master’s degrees in biology at Fordham, and in 1972 entered the doctoral program at the State University College of Environmental Science and Forestry at Syracuse. There he began working with State Museum scientists on one of their most vexing research challenges: finding an environmentally safe way to control a plague of black flies in the Adirondacks, where swarms and slashing bites were making life and tourism unbearable in the spring and early summer. He began by converting a ramshackle fish hatchery in Cambridge, about 40 miles north of Albany, into what is now an internationally recognized field laboratory. Dr. Molloy concentrated on finding agents that could kill the black fly larvae in streams before the adults emerged. He had no luck with natural parasites, but then he heard that a bacterial subspecies called Bacillus thuringiensis israelensis, or Bti, discovered in a stagnant pond in the Negev desert in Israel, appeared to kill the larvae of black flies as well as those of mosquitoes. Three years of intensive lab and field trials by Dr. Molloy, part of an international scientific effort, demonstrated Bti’s effectiveness and environmental safety. It is now widely used in place of chemical pesticides throughout North America. In 1990, when Dr. Molloy learned that invasive mussels had infested New York power plants, he began looking for a bacterium that could do to them what Bti did to black flies. The odds were against him, he recalls. There were thousands of potential candidates, and a single species of bacterium can have multiple strains that produce widely different effects. Nor was there any guarantee that any of them could control mussels. In 1995, after four years of testing more than 700 bacterial strains, excited staff members called Dr. Molloy into the lab. “Strain CL145A,” a bacterium he had collected in river mud, was killing zebra mussels. It turned out to be a strain of P. fluorescens. By contrast with caustic chemicals like chlorine, which cause the mussels to quickly shut their valves, the bacterium seems to travel normally through their inhalant siphons and into their digestive tracts. “Although ingestion of CL145A cells is clearly suicidal behavior for the mussels,” Dr. Molloy said, “they appear to have no adverse reaction” when they first feed on the cells. Recently retired from the State Museum, Dr. Molloy is now a research biologist at the University at Albany, where he is assembling an international team of scientists to take on a new challenge: Haplosporidia, spore-forming parasites that have plagued bivalves worldwide. There are more than 40 species, including the notorious Haplosporidium nelsoni MSX, which has devastated oyster populations in the Chesapeake Bay and along the Atlantic Coast. No one has been able to figure out how the spores spread infection from one host to another. Dr. Molloy’s team has discovered a freshwater version of the parasites, H. raabei, that infects zebra mussels, and will try to understand its life cycle.